This Sticky Sweet Quinoa Salad with balsamic shallots is very simple in its use of ingredients but has so much depth of flavour. It’s also quick and easy to make. As I was short on time today, I wanted to throw something quick and healthy on the table. I still had some leftover quinoa from last night’s dinner. To add some fresh flavours, I quickly chopped two sweet pointed red peppers and I halved a tray of baby tomatoes. Then I remembered something my mum used to make when I was growing up. She slow-cooked whole (peeled) shallots in balsamic vinegar and sugar. Our whole house smelled like balsamic vinegar for hours. I never forget the intense, caramelised flavour of those sticky, sweet shallots. They were succulent and would pop open in your mouth. Not having that much time today (my mum would let it simmer for at least half an hour), I decided to finely chop my shallots. I threw them in a pan, added balsamic vinegar and coconut palm sugar and within 4-5 minutes the vinegar was reduced into a lovely, sticky syrup. Quite close to what my mum would make but much less time. The sweet, sticky shallots and the left-over syrup serve as a vinaigrette in this dish. It adds a beautiful sweet flavour and also makes it more succulent. Enjoy your Sticky Sweet Quinoa Salad! Rinse quinoa and cook for 10-15 minutes. Make sure the quinoa still has a little bit of a bite to it when you drain it. Allow quinoa to cool down. 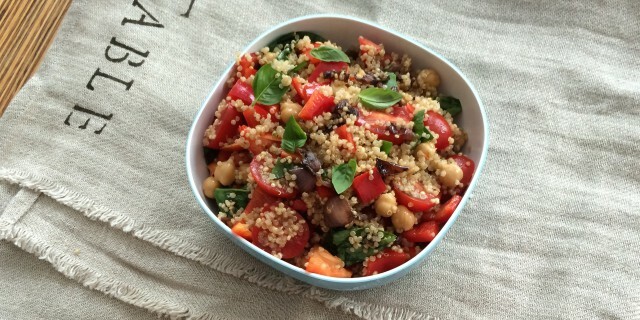 Then, add the cooled down quinoa to a large salad bowl. Add the tomatoes, pepper and chickpeas. Sprinkle olive oil on top and season with freshly ground black pepper and sea salt. For the Balsamic Shallots, add the shallots to a small saucepan. Add the vinegar and bring up to a medium-heat. Add the sugar when it starts to simmer. Allow to simmer for 4-5 minutes or until the liquid is almost dissolved and syrupy. The shallots should be soft, sweet and sticky. Add the shallots to the salad ingredients and mix well. Serve with fresh shredded basil leaves and feta cheese (optional).